A simple question … with a complex answer! The concept of ‘the pod’ is nothing new. ‘Pod’ has been inspired by nature. From pea pods to chrysalises, the concept itself is simple: a protective shell around a living thing. And humans have taken this idea and used it their own advantage for centuries: think of the nomadic tribes that have roamed the earth who’ve settled during their travels then created their own living space for shelter and warmth. Fast forward a few thousand years, and our connection to the natural world can now be expressed in a modern day version of the above. The glamping pod is here! 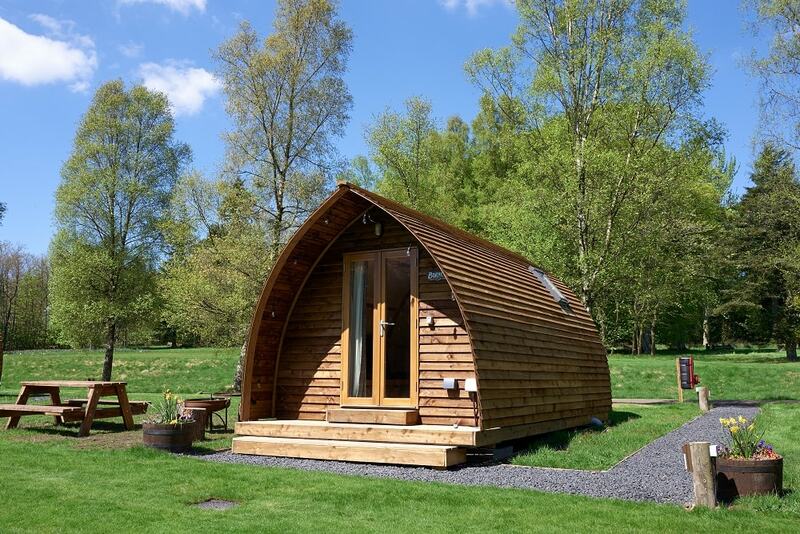 What is the difference between a glamping pod and a Wigwam® Cabin? There is a little fly in the ointment, though … there’s pods … and then there’s Wigwam® Cabins. Let’s dig a little deeper and find out more! Pod has become a term that conflates a number of concepts. An empty, enclosed space; a form of shelter; maybe created from timber and it could also be from a durable fabric. Pod also implies that it’s perhaps a more basic type of shelter, maybe with a door and a window at best. Shapes of pods can also vary: square, half-moon or even hexagonal! It is thought the idea of pods or similar date back to the 1100s, but reality, shelters such as this probably began with the cool, sheltering caves of the Stone Age. And then if you consider the wealthy Europeans and sometimes the Americans in the 19th century … the well-to-do would travel to Africa with luxurious safari tents that would be crammed with antique furniture, soft beds, Persian rugs and other items. The aristocracy and upper classes certainly did not want to lose touch with luxury! With the advent of camping and exploring the great outdoors, basic tents were popular with those who really didn’t care about comfort. Polar explorers and early mountaineers used basic tents for shelter. As time progressed, science came up with better fabrics and this also transcended into domestic tents that became more elaborate and … bigger! However, even with tents the size of stately home, they still have their limitations. They can be cold and there’s a lot of kit required to keep warm and dry. And it can often take just one tiny rip to cause a leak. Therefore the glamping pod has become a viable option. Not as dependent on the elements and of a more sturdy design, the pod took away the threat of tent disasters: forgotten tent pegs, ripped ground sheets and sometimes even a lack of tent can be a thing of the past. So with the arrival of glamping came Wigwam® Cabins … it could even be said that Wigwam® Cabins spearheaded the glamping phenomenon which is so popular today. To understand the differences between a pod and a Wigwam® Cabin, you have to do a bit of time travelling! Founder of Wigwam® Holidays, Charles Gulland was a graduate back in 1989 (the year the Berlin Wall crumbled and the map of Europe was altered forever). One of his first roles was to research and develop profitable use of home-grown timber and he eventually became Designer in Residence with the Countryside Commission for Scotland. Following this in 1992, Charles founded All Round Buildings Ltd (known today as Wigwam® Cabins) in which he used timber thinnings (usually larch) to make a cabin prototype. These first models were installed in Scotland and immediately struck a chord with walkers and hikers. In 2000, Charles launched Wigwam® Holidays Ltd along with the website wigwamholidays.com. As of July 2018 there are over 80 sites listed with the Wigwam® Brand. Starting with the Wee Brave, which sleeps three guests, the designs soon included Big Chiefs, which take up to a family of five; and as glamping became increasingly popular, so the spec became more elaborate, and Running Water and Running Water Deluxe came about – the former with a toilet, the latter with loo and shower. Both also included kitchenettes and dining areas, and about as far away from a basic pod as could be. And while it is inevitable that the English Language has telescoped the word ‘pod’ together with the term Wigwam® Cabin, these impressive cabins a heavyweight in the pod world! As well as being en-suite, with a cooking hob, TV in most, French doors and Velux® windows, there’s also the comfy raised mattresses, the storage space, and lush smell of fresh timber. They are also made here in the UK and are transported as a finished product to sites across the UK. And while planning permission is required, Wigwam® Cabins are substantial and can be accurately described as a home from home. Beware of copies (of which there are many). While the brand is a registered trademark, the shape could not be patented. And sometimes, as the term ‘wigwam’ has roots in Native America culture (meaning domed dwelling), it is occasionally confused with the term ‘tipi’. Yet by this stage you’ll be pretty aware of the differences between pod and a Wigwam® Cabin. And it doesn’t stop here. The Wigwam® Cabins are ‘the constant’ across all sites which dot the UK countryside. Existing and new sites all boast great scenery and locations: a warm welcome and a recognisable concept. So if you stay in a Wigwam ® Cabin on the Isle of Skye, then you’ll find the same quality glamping experience in Cornwall. And that’s not all! With the changing climate, the UK could experience harsh winter and hot summers. In 2018, temperatures plunged to minus 15 degrees in place and then soared to 32 degrees Celsius. Wigwam® Cabins can cope. To conclude, then, the history of the pod goes back across the mists of time. Wigwam ® Cabins have now come of age, and improved upon an age-old concept without comprising the link to Mother Nature and natural world – in fact, you can take a great holiday in the great outdoors, thank to Wigwam® Holidays!